Unforeseen car collisions are devastating. When your vehicle has been deemed a total loss by your insurance company, you might have serious questions about current car loans you have on a vehicle that is now inoperable. Your insurance company is the primary authority when determining whether your car will be considered a total loss after a car accident. This determination is most commonly made by calculating the price of repairing the car and comparing it to the overall value of the vehicle. 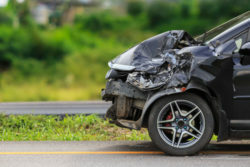 Insurance companies will typically consider any repair costing around 80 percent of the value of the car a total loss, but rules vary depending on their specific policies. If your vehicle is considered a total loss, then your insurance company will send a total loss check to you. It’s possible that this sum of financial compensation will not be enough to meet the remaining balance on your car loan, and you will still be held legally liable for that remaining balance despite no longer having the car. In addition to this unwelcome financial burden, the car accident may have caused you physical personal injury with additional medical bills. These financial losses incurred after a car accident can be reclaimed by holding the negligent party liable in a personal injury case. The attorneys at The Paris Firm have extensive experience representing injured victims in court. We will aggressively fight for your right to be fully financially compensated for all losses you’ve suffered due to the accident. Reach out to our lawyers now by using our contact page.